Our plated shamrock necklaces are offered various colors including gold, silver and rose gold tones; additionally, we also have some stainless steel shamrock pendants and plated clover necklaces too. 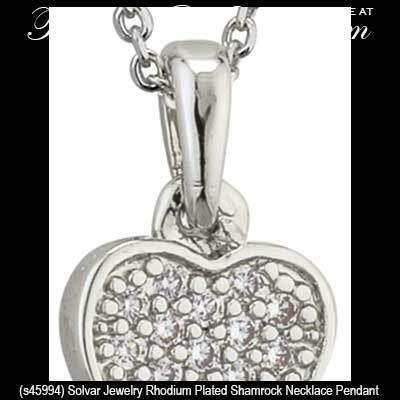 Take a look at all the many combinations we offer in plated shamrock pendants. You will see green enamel accented necklaces along with those that have leaves accented with crystals. Additionally choices include pendants with real shamrocks and shamrock necklaces that incorporate Celtic knot designs. 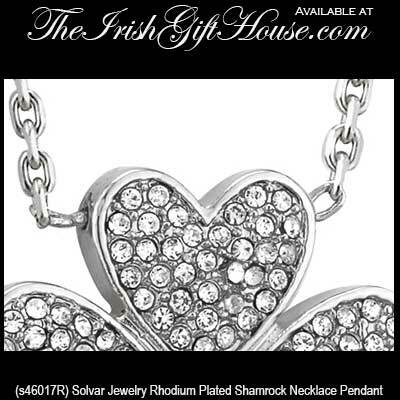 Naturally, The Irish Gift House also offer classic shamrock necklace designs, so you may have a hard time deciding with so many different choices. This rhodium plated shamrock necklace features crystals and pearls. 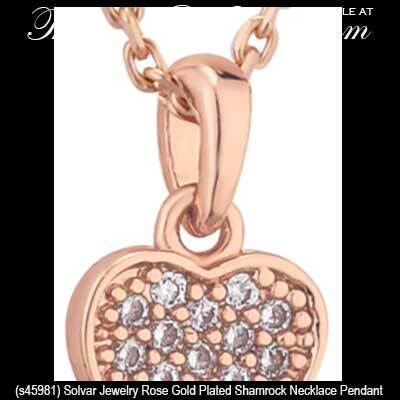 This rose gold plated shamrock pendant is enhanced with CZ stone studded leaves. This gold plated shamrock pendant is enhanced with CZ stone studded leaves. This rhodium plated shamrock pendant features crystals in the leaves. This rhodium plated shamrock pendant features crystal studded leaves. This gold plated shamrock pendant features crystal studded leaves. This rhodium plated shamrock pendant is set with emerald green and white crystals. This gold plated shamrock pendant is set with emerald green and white crystals. The rhodium plated shamrock pendant and stud earrings are enhanced with crystal leaves. Green enamel shamrock pendant and earrings set. This rhodium plated Irish fairy necklace is holding a shamrock. This rhodium plated shamrock necklace features multi colored crystals. The shamrock key and the Trinity knot lock charms on this Celtic necklace are accented with crystals. This gold plated shamrock pendant is enhanced with rhodium plated Celtic knot accenting. This gold plated shamrock pendant features green enamel leaves. This stainless steel shamrock pendant features green enamel accenting. This gold plated shamrock necklace features a traditional design. 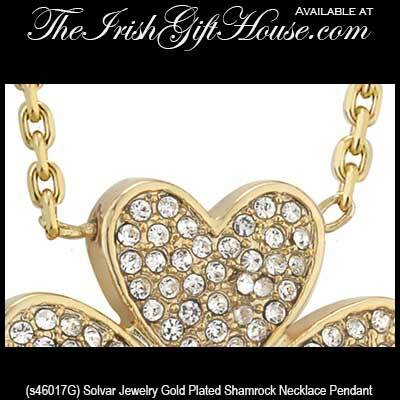 This gold plated shamrock necklace features a shiny finish. This rhodium plated shamrock necklace is set within a circle and it is enhanced with crystals around the open rim. This heavy shamrock pendant, with a thick rhodium plated rim, could be suitable for a man. 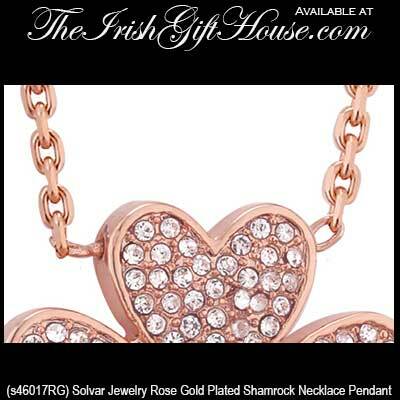 The leaves of this rose gold plated shamrock necklace are studded with CZ stones. The leaves of this rhodium plated shamrock necklace are studded with CZ stones. This rhodium plated shamrock necklace features green glass stones. This gold plated shamrock necklace features green glass stones. Just like with our precious metal shamrock necklaces you may wish to create a complete set and view our plated shamrock earrings; we offer them in drop, stud and hoop styles. The Irish Gift House also features shamrock bracelets that should match your other selections well. Just about every aspect of the Irish and Celtic jewelry we stock is represented with overlaid designs; you will find a great selection of plated Connemara marble necklaces and Tree of Life pendants that may also compliment your shamrock earrings. With that in mind we would be remiss if we didn't mention our very large assortment of plated Celtic cross necklaces; this iconic Irish Christian symbol may just be the perfect complement to any of our selections.